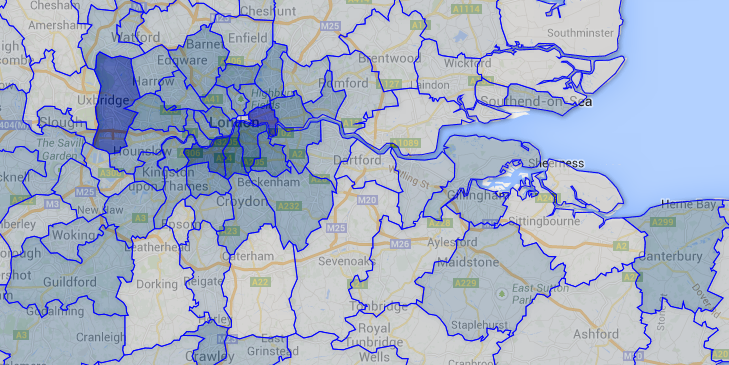 Map: Estonians in England and Wales – how many really are there? In April 2013, Labour MP and shadow immigration minister Chris Bryant courted controversy when he slammed businesses in his South Wales constituency for “hiring Estonians and Latvians” instead of the local population. “It would be nice sometimes when you go into a British hotel if the receptionist was British,” was the remark that drew most criticism, suggesting to many that the opposition was just as confused on the issue of immigration as the government. But, immigration policy aside, it made me curious as to just how many Estonians are there in the United Kingdom. Obviously there must be a reasonable number, I supposed, as otherwise how could the shadow minister for immigration and a former minister for Europe make such a claim about all these Estonians pushing out the locals? A useful statistic is the amount of National Insurance numbers that are given out to foreign nationals – an NI number is essential if you wish to work legally in the UK, pay tax and claim any sort of state benefit. As you can see in the chart below, the largest amount of NI numbers given to Estonians was during the period immediately following its accession to the European Union. In total, for the years 2002-2012, 17,851 National Insurance numbers were granted to Estonian nationals. This figure doesn’t tell us how many Estonians live in the UK at any given time, but does tell us that over the decade as a whole, over 17,000 Estonians worked or applied for work in the UK at some point. Bizarrely, the UK Office for National Statistics does not publish a complete breakdown of the number of foreign nationals living in the country, only a breakdown of the top 60 nationalities and an estimate as to the number of people from each one. It’s a list on which Estonia does not feature. The ONS has, however, published a detailed list of the number of people who indicated in the 2011 census that their “main language” was Estonian. The map below, produced using Google Fusion Tables, presents this data in interactive form for England and Wales (the data for Scotland and Northern Ireland wasn’t available when work commenced on the map). There are various caveats, namely that despite completing the census is a legal requirement, not everybody does so. Similarly, the census is a snapshot of the country on the day on which people were asked to complete their census form. Those who were abroad on census day (I was in Vienna, for example) therefore are not included. You could be an Estonian national whose main language is Russian or, if you’re married to a UK citizen, English. Or you might be living in a shared house with some Germans and therefore your “main language” could still be English. There are numerous other scenarios – therefore these figures are to be used with caution. According to the census, England and Wales was, on census day, home to 3,398 people who listed Estonian as their “main language”. Like most population figures, this is likely to be an underestimate but I’m not willing to predict by how much. I surveyed 15 Estonians I know who were living in the UK on census day, and 13 assured me they fulfilled their legal obligation (one admitted they hadn’t and the other couldn’t remember). Based on that most unscientific of polls, the census results should be fairly accurate. Or perhaps I just know more conscientious Estonians? Nevertheless, the map does indicate which geographical regions are more likely to contain Estonian nationals than others. London, unsurprisingly, has the highest concentration of Estonians, namely in the boroughs of Tower Hamlets and Hillingdon. Birmingham and Manchester similarly have boroughs with a sizeable (over 40 people) Estonian population, as do the university cities of Cambridge and Oxford. Leeds and neighbouring Bradford would, if combined, contain the highest concentration of Estonian native speakers in the country – Bradford is, after all, home to both an Estonian club and an Estonian school and attracted a large number of Estonians after World War Two. If you can highlight any other possible communities or interesting points, let us know in the comments. Despite all that, the total number of Estonians is still a mystery and likely to remain so, as the government doesn’t publish the figures for people entering or exiting the UK. Nevertheless, I would regard any figure above 10,000 with some scepticism. So what of Rhondda, the constituency of Chris Bryant MP? Rhondda itself forms part of the (larger) Rhondda Cynon Taf local authority, for which the census records nine Estonian speakers (and, for the record, six Latvians, also singled out by Bryant). Even if these figures only represented 10% of the actual number (itself an error that would make the census beyond useless), Estonians would still be outnumbered ten to one by those with an East Asian main language and four to one by those listing an African main language. Why pick on the Estonians, then? Well, it’s easier politics to be xenophobic than racist – an accusation of xenophobia isn’t the same as an accusation of racism when it comes to newspaper headlines, unfortunately. Much easier to pick on those bloody Eastern Europeans, innit?